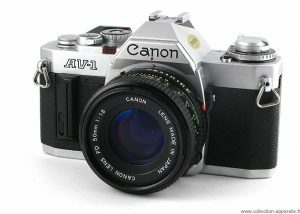 The Canon AV-1 is a 35mm single-lens reflex camera with an FD lens mount, introduced by Canon Inc. in 1979. The AV-1 was very similar to the 1976 AE-1 but provided aperture priority autoexposure rather than the AE-1’s shutter speed priority AE. The camera is not capable of fully manual exposure. Canon’s international distributors, particularly in the United States, had clamored for such a camera because competing brands offered mostly aperture-priority cameras and some preferred it. The AV in the name referred to the type of autoexposure; Av (Aperture Value) is a common abbreviation for aperture priority. When this camera appeared, a new range of FD lenses was introduced, featuring instant mounting/unmounting of the lens. This was called the New FD mount and did away with the older type of mounting ring which was fitted on to the rear of the lens and was awkward to use and needed two hands, to a newer, easier system whereby the user lined up the red dot on the lens, with the red dot on the camera and simply turned the whole lens clockwise until it clicked into place. All the other AE-1 accessories fit the AV-1.